Next week is the start of deer hunting season here in western Pennsylvania*, so BAMF Style is taking a look at the appropriately titled “The Hunt”, the seventh episode of Justified‘s sixth and final season. The episode title primarily refers to the hunt for fugitive killer Ty Walker (played brilliantly by Timothy Olyphant’s fellow Deadwood alum Garret Dillahunt) but it also alludes to Boyd and Ava’s venture into the woods. Ava: What the hell, Boyd? Boyd: First day of razorback season, state of Kentucky. I already got the coffee going. Ava: What time is it? Boyd: It’s early. And we need to get to the stand while the sun is rising if we gonna bag us a shoat. Boyd takes a nervous Ava (Joelle Carter) up to his long-departed father’s cabin up in Bulletville, an aptly named location that lent its name to the first season finale. After a night that finds Boyd breaking into a rare bottle of 20-year-old Pappy Van Winkle’s Family Reserve**, he leads Ava on an early morning razorback*** hunt, laced with innuendo about killing and betrayal made all the more menacing by the audience’s knowledge – and Boyd’s justified suspicion – that Ava is Raylan’s informant. It isn’t until after he goes off to kill a wild boar and leaves an alarmed Ava unarmed, that he confronts her with his knowledge. 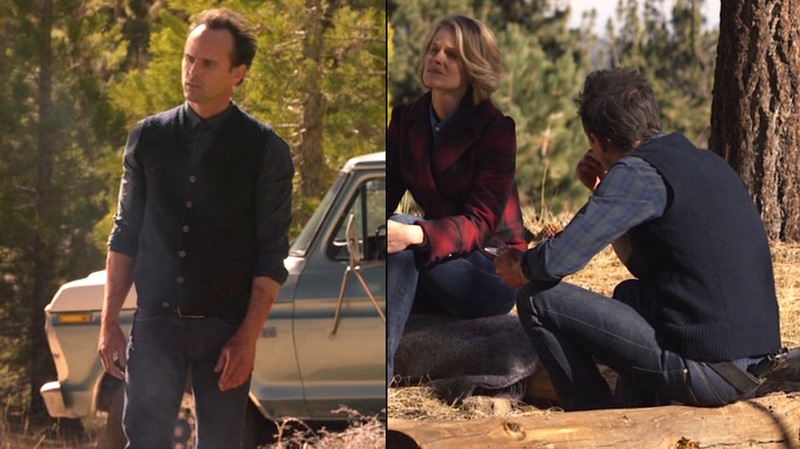 Both Walton Goggins and Joelle Carter brilliantly seize this opportunity to further define their characters with only six episodes remaining in the show’s run. 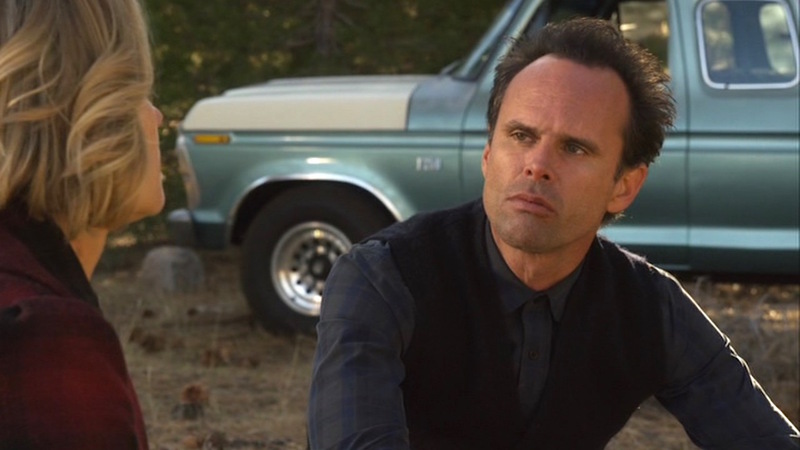 Goggins subtly but definitively throws the full weight of Boyd’s character into each line he delivers, including his seemingly sycophantic small talk that previous opponents like Devil and Johnny recognized as an exploitative weakness to their own peril. 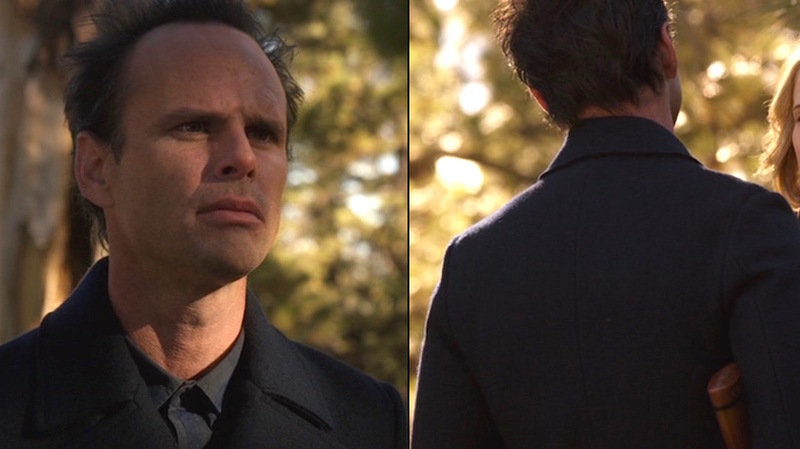 Goggins conveys that Boyd’s primary fear is that he has lost Ava’s love, hence his seemingly greater concern that she has returned to Raylan as a romantic interest in addition to being his informant. His fear strips away the sinister layers that he had adopted for their ominous morning as he desperately tries to connect with Ava. A more one-note villain may have seen her confession as the means to her fatal end, but the complexly conflicted, twistedly romantic Boyd convinces himself that his and Ava’s love can be salvaged, and she even acknowledges the possible toxic nature of their association before signing on to rationalize their mutual delusion. * Western Pennsylvania doubled for Kentucky during Justified‘s pilot episode, which was filmed in the greater Pittsburgh area near me! ** This show loves good bourbon! *** For those not in the know – like me when I first saw this episode – a “razorback” is an American and Australian colloquial term for a wild boar or hog or feral pig. 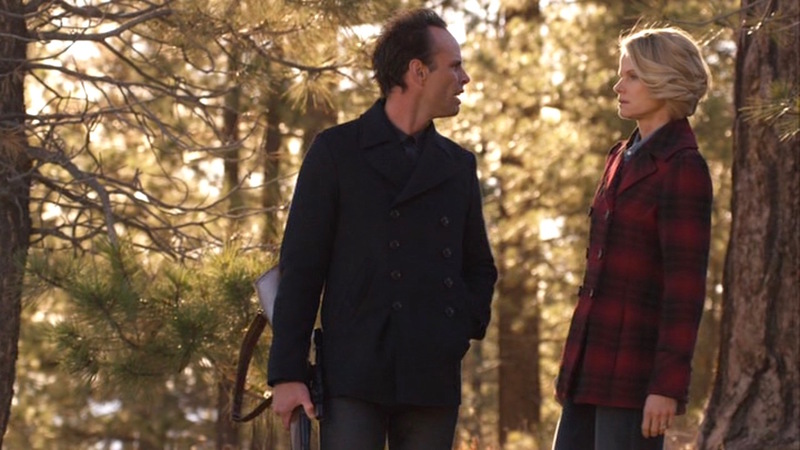 Boyd Crowder first donned a pea coat in the third season of Justified when he sported a black wool model over a seemingly endless collection of plaid flannel shirts… always buttoned up to the collar, of course. He wore this coat through the bulk of the third season with sporadic appearances in the end of season 4 and beginning of season 5. Neither of them may be particularly good people, both Boyd and Ava both know how to rock the hell out of a stylish pea coat. 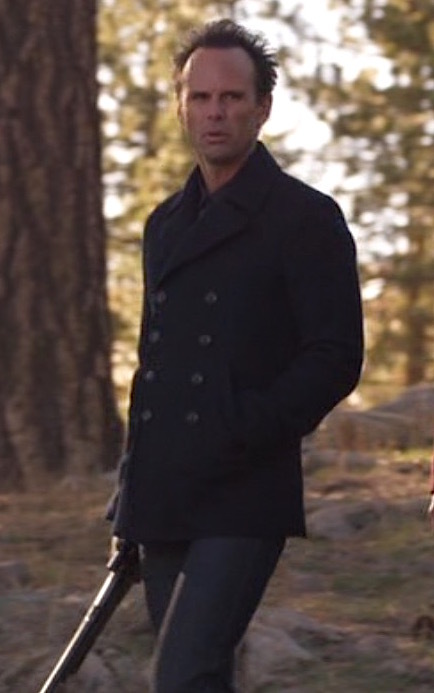 Boyd’s navy Aspesi pea coat has four closely spaced rows of two dark navy plastic buttons, creating a tight 8-on-4 button layout that differentiates it from both his earlier pea coat and a classic naval pea coat. It has the usual broad “Ulster collar” lapels, short length, and slanted hand pockets characteristic of pea coats. The sleeves have roped shoulders and plain cuffs as opposed to his previous coat, which had single-button tabs at the cuffs. Due to its lighter weight, the coat’s seams are not swelled like the previous coat. The seam in the back splits at the bottom where there is a short single vent. With the pea coat, Boyd wears his increasingly common combo of a plaid shirt, vest, and dark jeans. His olive cotton shirt from Theory has a blue and black buffalo check. The black plastic buttons are fastened all the way up the front placket and closed under the spread collar; Boyd has an enduring habit for wearing his shirts buttoned up this way. The cuffs also fasten with a button, but Boyd rolls his sleeves up his forearms after removing his coat. Boyd’s choice of waistcoat for this day in the woods is a dark navy fuzzy wool cardigan sweater vest with a high-ribbed hem across the bottom. It has six large light brown faux-wooden buttons with the bottom button left undone. The welted pockets toward the hip are best seen when Boyd reaches for the Beretta in the back of his waistband. Boyd wears a pair of very dark indigo-washed denim jeans from Acne Studios with the classic five-pocket layout and slim throughout the legs down to the bottoms that Boyd finishes himself with a single turned-up cuff. Boyd’s belt is wide black plain leather with a large rectangular brass single-prong buckle, very similar to this belt from the appropriately named Moonshine Leather. Note the small sliver of a white undershirt poking out above the right back belt line as Boyd grips his Beretta. Boyd also sports his usual footwear, a pair of well-worn dark brown leather work boots with brown laces through four brass eyelets. The yellow oval logo on the soles, seen in other episodes, may help with identification. Boyd Crowder prefers to settle his differences with bourbon rather than bullets. He, and many characters on Justified, justifiably turn to Pappy Van Winkle’s Family Reserve whenever possible, but he cites the more accessible (and certainly excellent) Woodford Reserve as his preferred conflict resolution method. 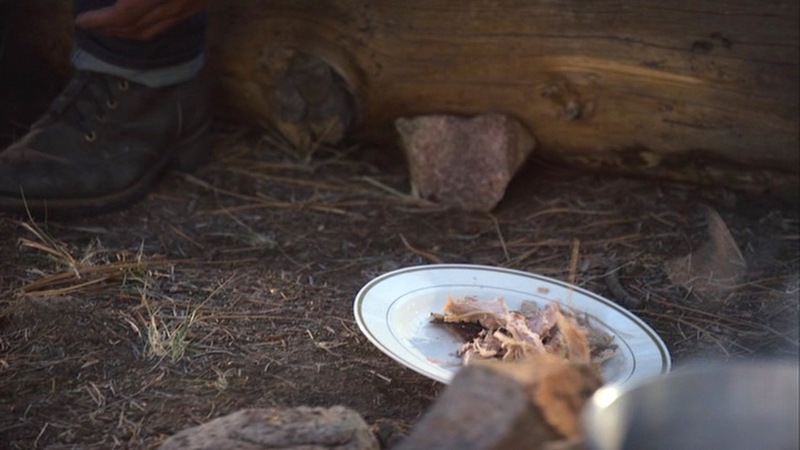 Boyd Crowder dresses warmly, fashionably, and directly on brand for his sinister hunting trip with Ava. The Theory shirt – size small, of course – remains part of an auction here, still available to Justified fans as of April 2018. Boyd: Are you sleeping with Raylan Givens? Boyd: Are you sleeping … with Raylan? Ava: You’re gonna ask me that? Boyd: ‘Cause if you are, take it. Take it! Take it! Put a bullet… in my head right now. Do it. In Boyd Crowder’s bullet-riddled world, this level of drama might be the epitome of romance. He wants Ava to know just how devastating her betrayal was to him… but he’s also testing just who’s side she is on. What Ava doesn’t know – and what we don’t find out until after she refuses to buy into his drama – is that Boyd’s gun, his go-to Beretta 92FS semi-automatic pistol that spends most of every episode either in his hand or in his waistband, is unloaded. Boyd checks his Beretta after testing Ava’s loyalty. Note the faux wooden buttons of his navy cardigan. 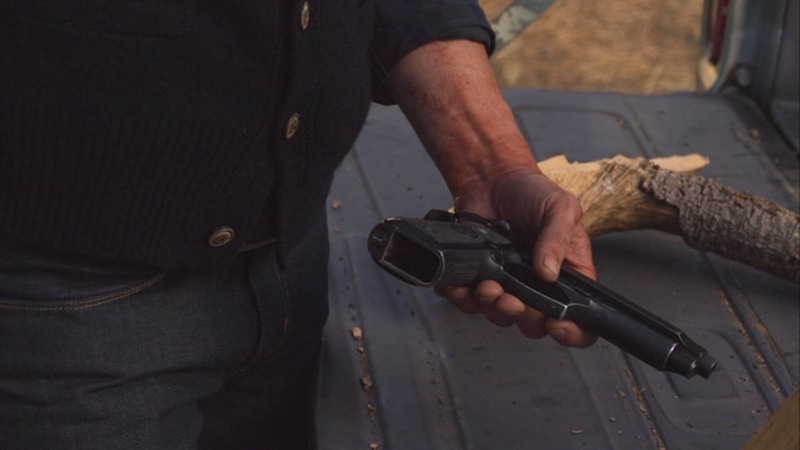 Naturally, given the episode’s title and the presumption that he is hunting wild hogs, Boyd also brings along a hunting rifle that appears to be a bolt-action Winchester Model 70 with a walnut stock and fitted with a scope. Check out the entire series . Also check out The Bourbon Babe’s entry from this episode, debunking several of Boyd’s claims about Kentucky, whiskey, and Kentucky whiskey. I’d include some here, but the post is so entertaining and well-written that – once you’ve watched “The Hunt” – you should read out for yourself! If they weren’t happy with their lot in my crew, why didn’t they just come to me? I’m a reasonable man. We could have hashed our differences out over a bottle of Woodford.